Drain garbanzo beans, and rinse to remove the residue from the canning liquid. It tastes terrible. In food processor, combine rinsed beans, tahini, oil, salt, sumac, cumin, cayenne and lemon juice until smooth. Add water and process until light and fluffy. You will have a light as air beautiful smooth paste, the consistency is like frosting. Adjust seasonings, you may need a teaspoon more lemon juice or a ¼ t. more salt depending on your brand of beans. Put it in the fridge and let it get COLD. Then before serving, spoon it onto a flat plate and swirl. Pour a thin stream of extra virgin olive oil directly on top letting it pool up in the coils. A dusting of cayenne pepper and cumin, a fresh sprinkling of paprika, A fist full of finely chopped parsley and chopped chives – yes right on top. Before serving, I swirl it with a chopstick. That leaves most of the garnish on top but swirls some in for flavoring. Then I let it sit like that on the buffet while coming to room temperature. Variation: omit water and add a jar of drained red peppers/pimentos to food processor and puree together. This makes Red Pepper Hummus, my personal fave. NOTE: You must make sure the tahini is fresh. It is like oil, it goes bad and most people don’t even know it. It must be stirred and kept in the refrigerator immediately after purchase. It must be smelled for freshness before every use. If it smells like old oil, rancid at all, discard. *I was in Israel with the kids. Cousin Igal (what a character) took us to Abu-Shukri in the old city in Jerusalem, a café owned by and Arab and a Jew. 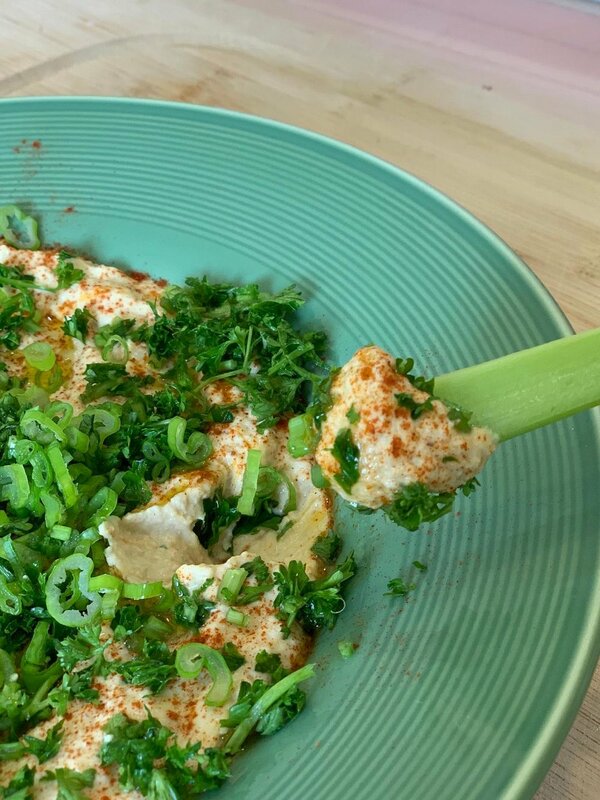 The café is known for having the best most perfect Hummus. I could not believe what I was eating. It was a revelation. I begged them to tell me, and they did…NO Garlic and ADD Water!!! Wow…such amazing Hummus…should I say it again? ok, Such amazing Hummus. And eat with pickles, as it is a ‘digestive’ and helps to alleviate the ‘too full’ feeling! Abu-Shukri…go there one day and be amazed or make this and be happy at home!